Marigolds are delightful flowers that will bloom from spring throughout the summer until frost. They are a tender annual so if a frost shows up after you have planted them, cover them to protect them. 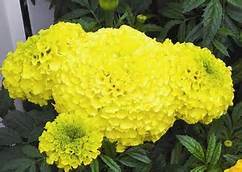 Marigolds come in a variety of colors and will grow to different sizes depending on variety. They are drought tolerant and have that familiar Marigold fragrance. Plant them in full sun and well drained soil. Add some bright bursts of color in containers or annual planting beds, or use them as a border. Boy Yellow Marigold is a French Marigold that has bright yellow flowers and grows to a height of 5" to 8" tall and 6" to 8" wide. 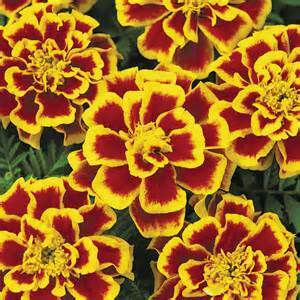 Use Boy Yellow Marigold as a Filler in containers. Durango Bee Marigold is a French Marigold that has red petals edged in yellow. They will grow from 10" to 12" tall and 8" to 12" wide. Use Durango Bee Marigold as a Filler in containers. Durango Bee Mix Marigold is a French Marigold that has a mix of yellow, orange, and bee marigolds. They will grow from 10" to 12" tall and 8" to 12" wide. Use Durango Bee Mix Marigold as a Filler in containers. Durango Orange Marigold is a French Marigold that has orange petals and will grow from 10" to 12" tall and 8" to 12" wide. Use Durango Orange Marigold as a Filler in containers. Durango Red Marigold is a French Marigold that has mostly red petals with tinges of yellow and will grow from 10" to 12" tall and 8" to 12" wide. 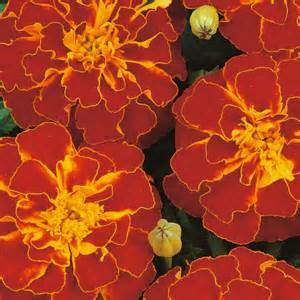 Use Durango Red Marigold as a Filler in containers. Durango Yellow Marigold is a French Marigold that is a bright deep yellow and will grow from 10" to 12" tall and 8" to 12" wide. 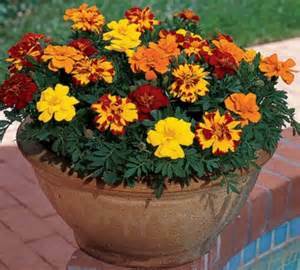 Use Durango Yellow Marigold as a Filler in containers. Perfection Orange Marigold is an African Marigold that has almost round balled flowers that are a bright pure orange. They will grow from 14" to 16" tall and just as wide. Use Perfection Orange Marigold as a Thriller in containers or as a Filler in larger containers. Perfection Yellow Marigold is an African Marigold that has almost round balled flowers that are a bright pure yellow. They will grow from 14" to 16" tall and just as wide. 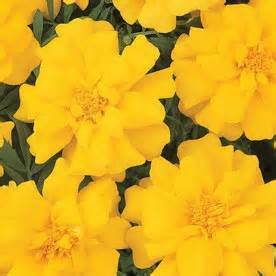 Use Perfection Yellow Marigold as a Thriller in containers or as a Filler in larger containers.